The Spanish Mosque (Urdu: مسجد اندلوسى ), also known as Masjid Iqbal Ud Daula or Aiwan-E-Begumpet, is a mosque in Begumpet, Hyderabad, India. The mosque was constructed by Paigah Nawab, Nawab Sir Iqbal Ud Daula in 1906, after his return from Spain, as he was very much inspired by the Cathedral–Mosque of Córdoba. The exterior and interior of the Spanish Mosque is mostly similar to the Cathedral–Mosque of Córdoba in Spain and Jama Masjid Gulbarga, Karnataka, India. It shows state-of-the-art interiors and architecture. It is also known as the Mosque of the Moors, due to its unique Hispanic (Moorish) style of architecture and is said to be one-of-its-kind in India. The stand-out feature is the spires instead of the usual minarets or domes; they give this mosque a church-like appearance. The mosque was built by the Paigah noble, Sir Vikhar-ul-Umra Iqbal-ud-Dowla, in 1906. It is believed to be the only one of its kind in India, with pointed arches, a pointed main roof composed of two truncated octagonal pyramids placed one above the other intervened by octagonal domes. The minarets aesthetically placed at corners of the parapet are in the same style and very unusual from those seen in other mosques in the city and elsewhere. It is difficult to miss from the flyover opposite the old Begumpet Airport. The other notable features are Moorish arches inside the prayer hall, Quranic verses in exquisite calligraphy inscribed on the inside walls, the absence of an ablution tank and a courtyard. In plan, the mosque comprises a main prayer hall, two rooms in front of it and a central corridor for entering the hall. It is over this central corridor or the entrance porch that the octagonal dome stands. The mosque is built with stone masonry in lime mortar up to the basement and the superstructure in brick masonry in lime mortar. The roof is jack arch type on iron girders with brick and lime concrete. The domes, minarets and small turrets are built with brick and stone masonry and the outer face plastered with lime mortar. The central dome has a perforated screen. 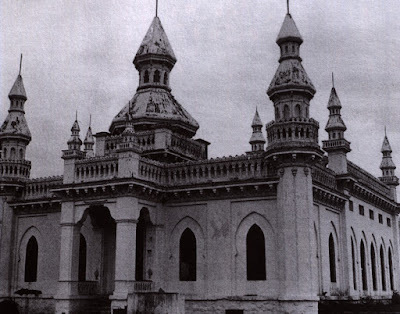 Believed to be a copy of a similar mosque in Spain, it might have caught the attention of the Paigah noble, either during his eight month long tour of Europe or he may have stumbled on a photograph. Whatever the source, the Nawab lived up to his reputation of being a great builder having a penchant for creating something unique, as seen from his magnificent hilltop Falaknuma Palace. Spain, once part of the Umayyad dynasty, is inundated with mosques. The Umayyad Caliphate influence can be seen in many of its buildings especially the religious ones. This was just one of the several estates given the honorific title of Paigah (meaning pomp and high rank) for the first time by the second Nizam, Nawab Nizam Ali Khan to the Paigah family’s founder, Nawab Abul Fateh Khan Taig Jung Bahadur. The mosque is also known by the local Muslim community as Masjid Iqbal Ud Daula, Masjid Aiwan-e-Begumpet. It can accommodate 3000 worshipers at once. The Spanish Mosque is very well known and is considered as a landmark mosque for the Secunderabad Muslim community. The Spanish Mosque formed part of the sprawling 340-acre wooded estate of the Paigah nobles studded with seven palaces, all built in European and Indo-European styles. Some of them are the Paigah Palace or the Iqbal-ud-Dowla palace that has now become the Hyderabad Urban Development Authority’s office, the Devdi Nazir Nawaz Jung, part of which has been leased to Chiraan Fort Club and the Vikhar Manzil, overlooking the Hussain Sagar lake and USA embassy. It is listed for conservation as a Grade II A structure, comprising buildings of regional or local importance possessing special architectural or aesthetic merit, cultural or historical value. They are the local landmarks contributing to the image and identity of the city deserving intelligent conservation and the regulation governing them allows adaptive reuse internally but external changes are subject to scrutiny. Yet the colour scheme of the mosque has been changed from pure white to pastel green in recent years. The Spanish Mosque is a declared heritage site by ASI and is under discussion for the consideration of UNESCO Asia Pacific Merit.